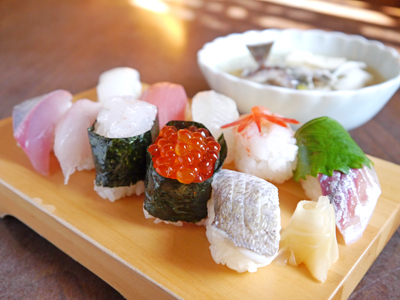 Fresh local fish from Toyama Bay, as well as pickled mackerel, pickled crimson sea bream, and Shiomiaji glass shrimp eggs are popular at this sushi restaurant. In the fall, this shop also serves homemade seasoning made with salmon roe from Himi. The shop owner's wife speaks English, to make it even easier for foreign customers.